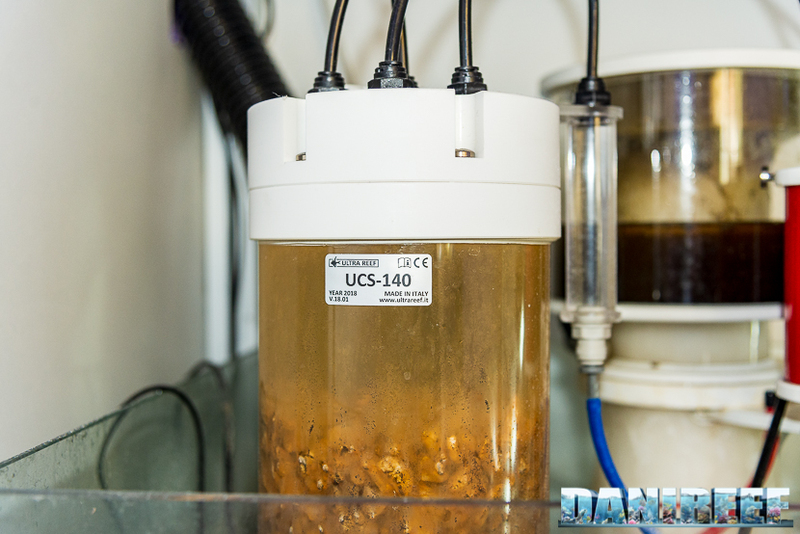 We can finally talk about the UltraReef UCS 140, calcium reactor, suggested by the builder for aquariums up to 500 liters (130 gallons), and tested in my reef aquarium of about 400 liters (100 gallons). 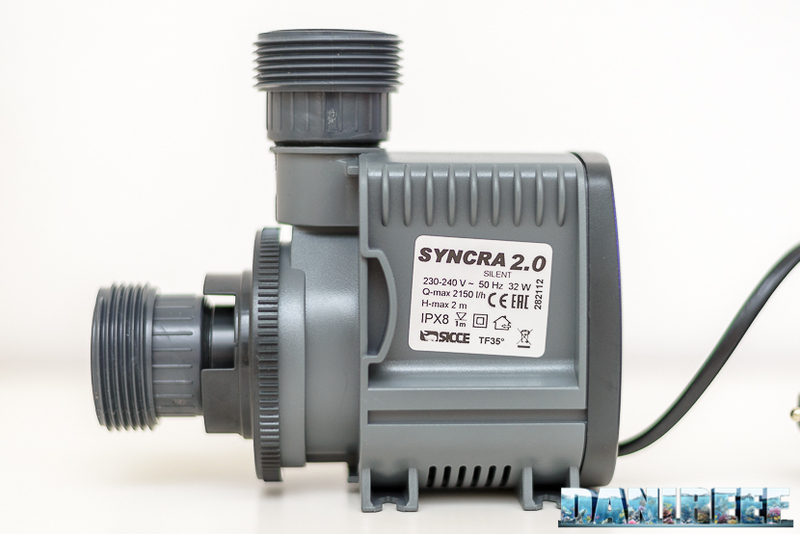 The reactor is equipped with just one pump, the Sicce Syncra 2.0 that we tested in the past and got great results from. 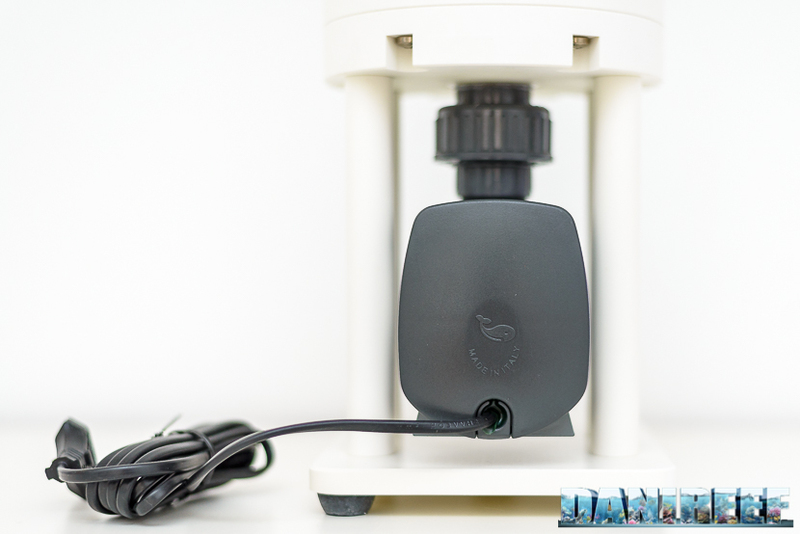 The UCS140 has a complete set of accessories for ease of use, such as a bubble counter and a probe holder. 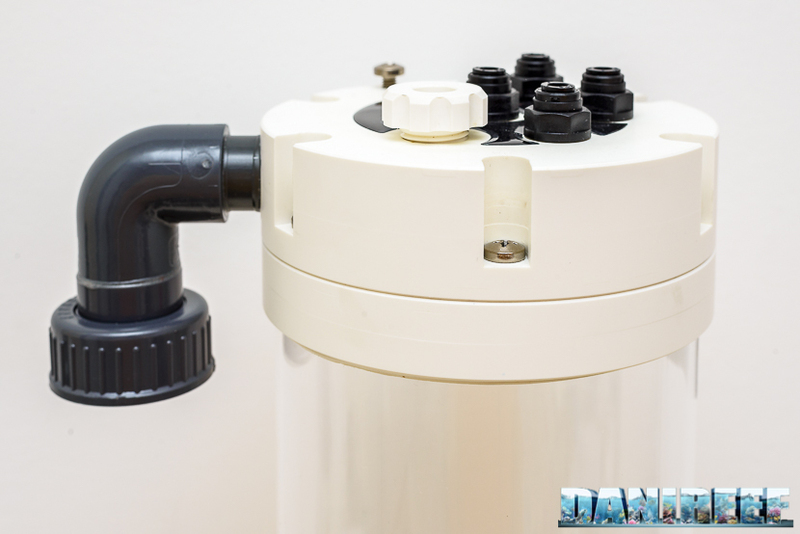 It’s only missing a feed pump – but the problem can be overcome by diverting the return pump, a method that I have used for several years. 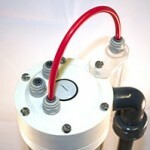 The reactor also has a pipe with a double probe holder and a deviation to be installed on your own return pump. It’s a very useful device that allows us to have the calcium reactor ready to use, at least in regards to the “hydraulic” part. For it to work it also needs a CO2 tank, a pressure reducer, and connecting pipes. 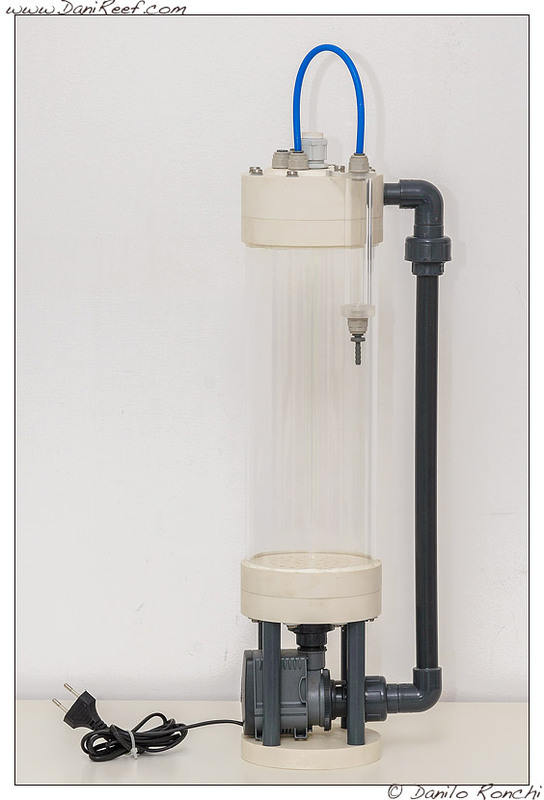 The reactor is very beautiful and impeccably built with acrylic in the central column and a fully turned base and cap. The connecting pipes are grey PVC. We always hope that UltraReef will use white PVC instead. We don’t know how much more it would cost, but it would be much nicer… don’t you think? One of the distinctive traits of the reactor is that it’s completely built in Italy, and it even uses an Italian pump (Sicce). The screws are titanium in order to resist corrosion. 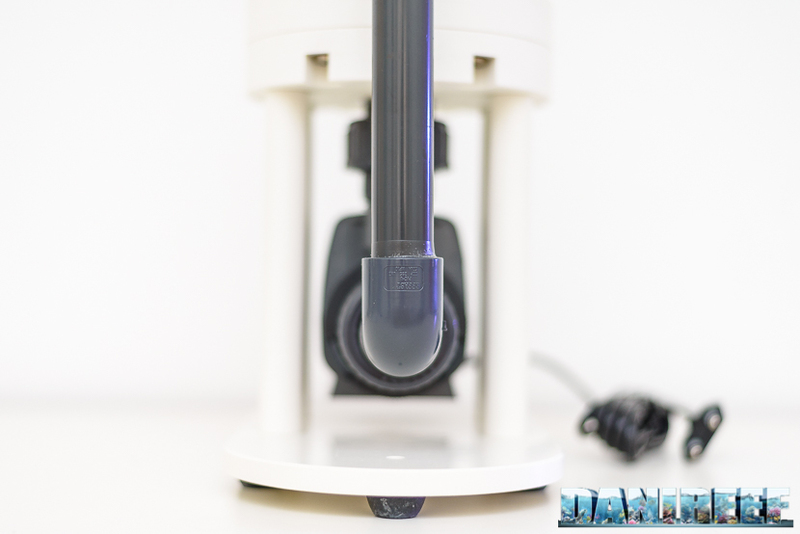 The reactor is a classic cylinder, with an external water recycler, leaving the inner cylinder completely available for the material. The water is moved by an external pump (not provided) or the deviation on the return pump directly under the cap of the reactor. From here it is aspirated by the pump that mixes it with the CO2 and pulls it to the base of the reactor where it is spread through a circular pierced plate, which is 14 cm in diameter. The Sicce pump can produce a flow rate of 1,944 l/h and 200 cm of hydraulic head. 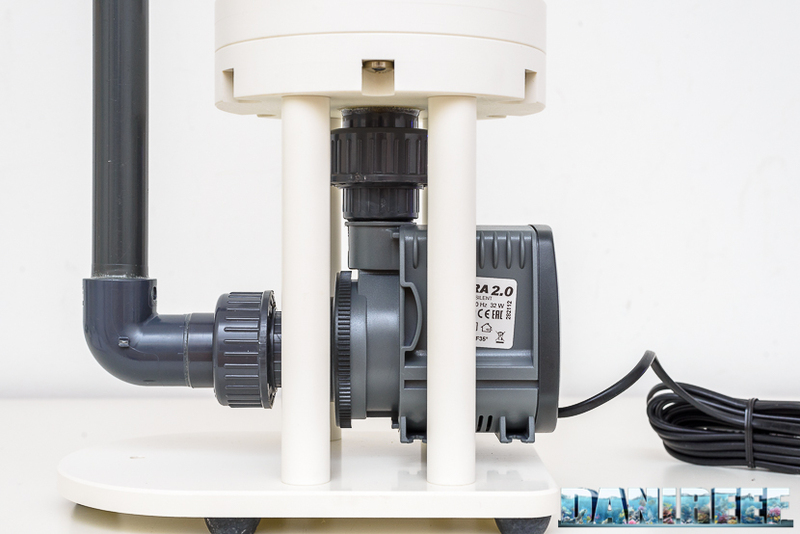 The pump is under the contact chamber, and it has lots of space to allow for adequate cooling, extending its life span. Over the cap, as we see in the following picture, we have the probe holder, the entrance for the CO2 coming from the bubble counter, and the central air vent. Extremely useful. The recycling of the CO2 is guaranteed thanks to the concave construction of the covering cap. The best filling material for this type of reactor with the diffusion on the bottom is medium-sized coralline reef and jumbo coral, but even CaribSea’s ARM, especially the coarse-grained one, should work well. For this test, I wanted to try the ARM, which has been a bit more problematic for me. I wouldn’t suggest the use of materials like calcium carbonate. With something compact like that, the diffuser couldn’t guarantee the pH stability throughout the column of the reactor. 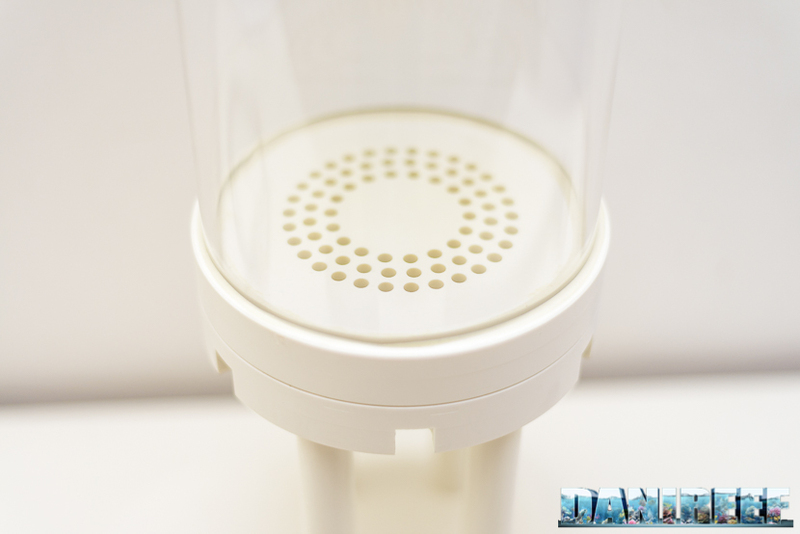 Moreover, and this might be even worse, very small particles could get inside the diffuser and damage the reactor. After connecting the pump and placing the reactor in the sump, connect the pipes, the bubble counter, the non-return pump, and the CO2 tank. Pictured below is the pipe with deviation that is supplied with UltraReef, an option I really appreciate. Below you can see the tap provided by UltraReef; the functioning has always been impeccable when using coralline, while I’ve always had problems with the ARM. We don’t have any problems to report concerning its functioning; in over 6 months of intensive use it never stopped, except when I ordered it to, and it has always worked perfectly. Even when there were blackouts, true and faked, it restarted its activity with no problems when the electric power turned back on. The material is loaded through the top, like most calcium reactors. 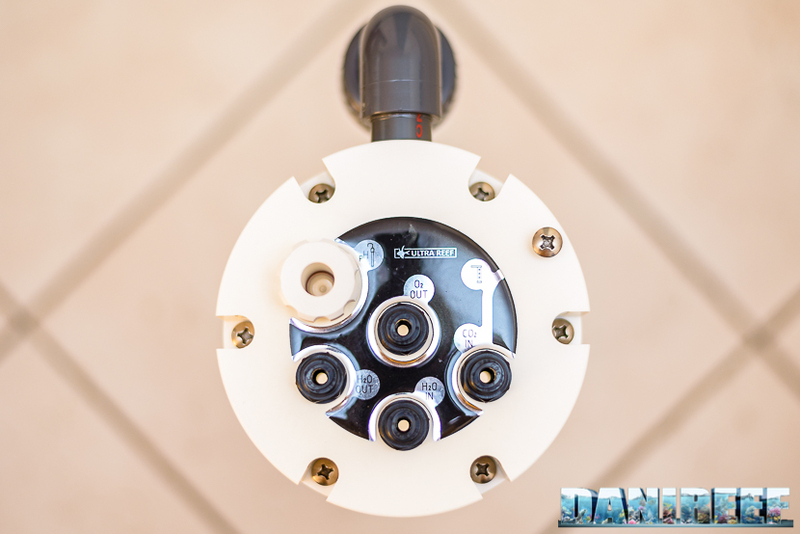 In order to load it, you need to unscrew the 6 titanium screws and extract the cap with all the connecting pipes. 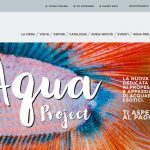 Before you have to arrest the alimentation to the CO2, to the recycling water and to the pump, so you can work directly in sump, without the need to extract anything. I like the system because it allows you to work in the sump, instead of having to extract the reactor. You can completely disassemble the reactor to inspect and clean it very easily. I suggest you to do this at least once a year. I used the manual calibration for the calcium reactor. The operation is extremely simple, I just manually adjusted the number of bubbles of CO2 entering through the the pressure reducer in the CO2 tank, balancing them with the drops exiting from the reactor, through the tap provided. I suggest beginning with a CO2 bubble entering every 2 seconds and a water drop exiting every second. The builder suggests starting with a bubble per second. 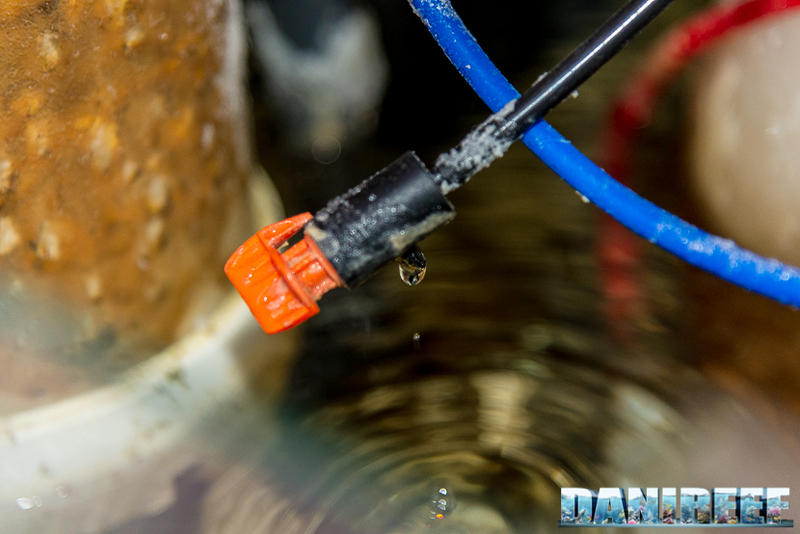 Changing the CO2 flow will adjust the internal pH while managing the drops will adjust the total balancing. After calibrating the reactor, you can proceed with adjusting the values of Ca, kH, and Mg before installing the reactor itself. After that you can assemble and calibrate it, and after waiting for at least a day you should do another round of measurements, one in the tank and another at the exit from the reactor, to see if the Ca and Kh is sufficient. At this point, you will compare the the values at the reactor’s exit to those from the tank. In order to have great efficiency the reactor should have a Kh reading higher than 30 at the exit, so if at the second reading the Kh is lower, you must increase the rate of CO2 bubbles entering, without changing the drops exiting. You will then have to wait another day and do the measurements again. Once the Kh is higher than 30 (35 or 40 is good), you will have to compare the value of Ca in the tank before and after using the reactor. If the value has decreased you must increase the rate of drops exiting, if the value is unchanged it’s good, and if the value has increased too much you can slightly lower the number of drops exiting. 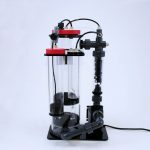 At this point you may have a small problem, because when you change the exiting flow, the internal pH will also change: with the same quantity of CO2 you will have to treat more or less water. So you need to slightly change the CO2 bubbles through the increase or decrease of its flow. You need to remember that over time your corals will grow and they are going to need even more calcium, so occasionally you will have to recalibrate the reactor. In addition, the filling material will decrease inside the contact column as it is used, since that will cause the efficiency to decrease, I suggest that you to keep the reactor at least 3/4 full and refill it often. 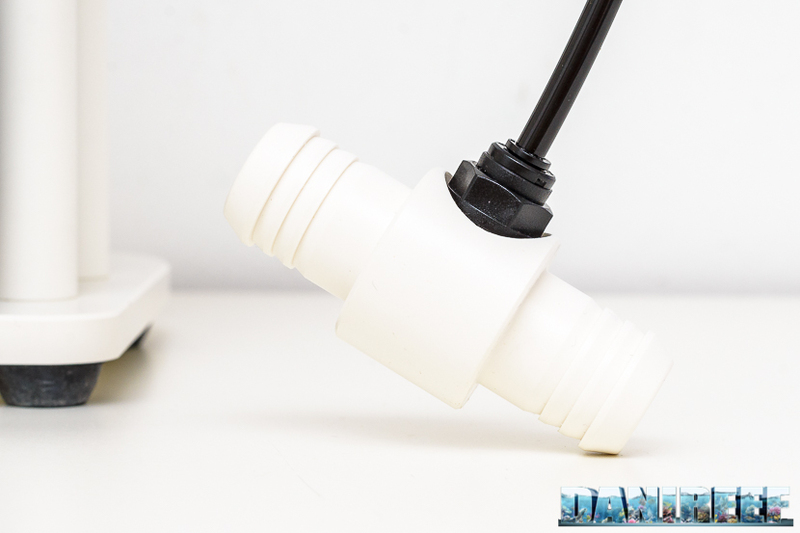 In order to make things easier and to get the potentially best outcome, you can use a solenoid valve controlled through a pH probe, inserted inside the contact column. 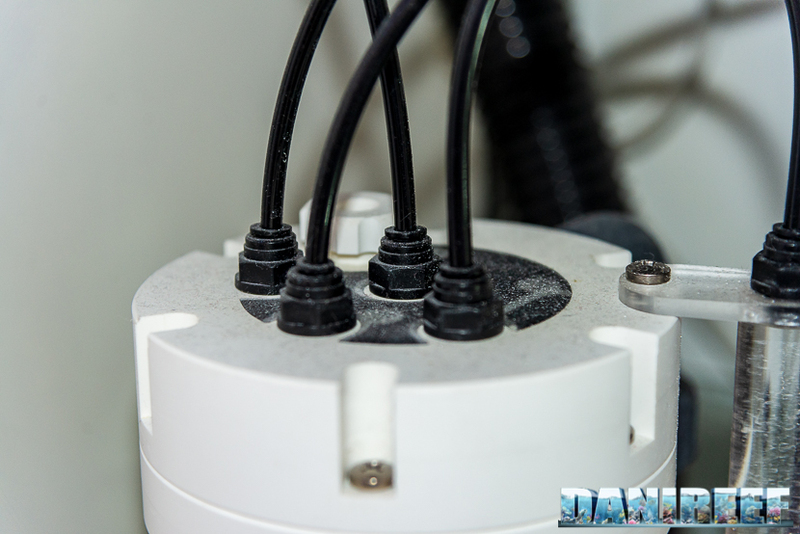 In this way the probe will read the value inside the reactor and you will be able to adjust the solenoid valve so that it will properly regulate the supply of CO2. Normally you can begin the supply of CO2 over a pH value of 6.25. The bubbles entering should have a frequency of about 2 bubbles per second, but not more. 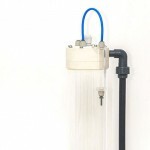 The use of the solenoid valve is beneficial because it allows for continuous supply to the calcium reactor. 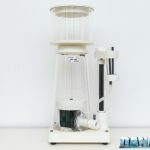 It will have almost constant values even as the amount of material decreases, which means that it will avoid an overdose of CO2 due to the decrease of the material or the changing flow rate by the supply pump. The only problem that doing constant calibration with the pH probe is that it could “get tired” after a certain time, about 40/45 days, and you have to recalibrate it based on your own experience. 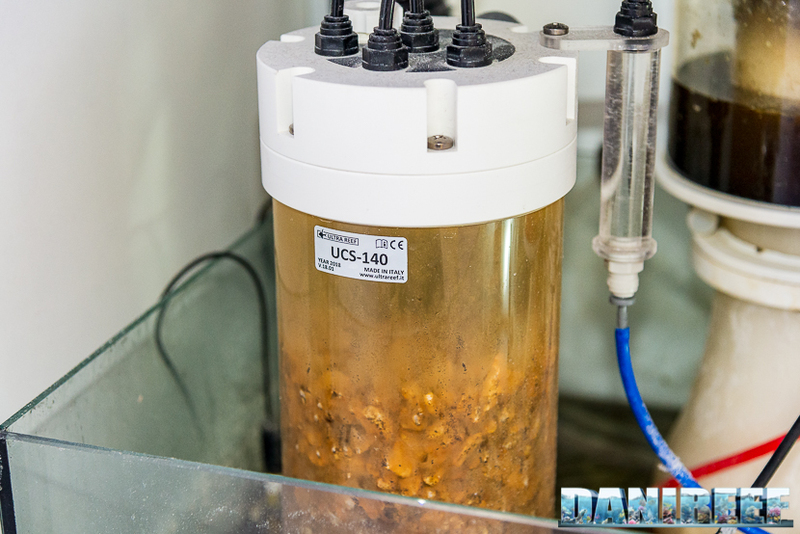 If you want the best results, attained by a perfect regulation of the calcium reactor, you should do the following valuation, especially good for aquariums with inferior algae, whose growth is stimulated by a low pH. 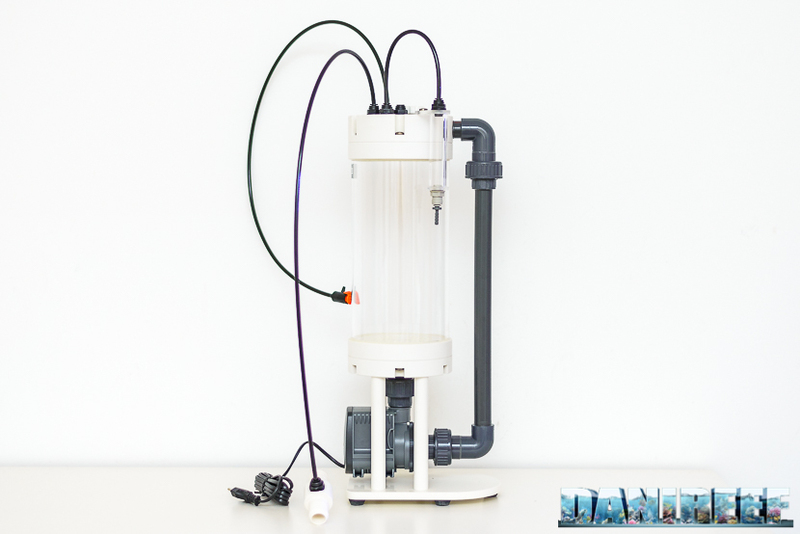 The lowering of the pH of the aquarium due to the exit of water with low pH becomes very critical at night, so thanks to the use of the solenoid valve and a timer, or a programmable computer, the calcium reactor could work just during the day, blocking the exit in the night hours by turning off the external supply pump, but leaving the recycling pump and the command of the CO2 by the solenoid valve. The water in the reactor would continue to recycle and the CO2 wouldn’t be dosed, so you wouldn’t have a problem with stagnation of the water or an excessive amount of CO2 in the reactor. Calcium reactors usually aren’t noisy devices, with the only audible noise being the shredding of the CO2 bubbles inside the recycling pump. But this reactor adopts a slightly different design than the usual, as the CO2 is put from above directly in the cycling circle – whose pump is at the bottom, which makes the shredding of the CO2 anaudible. 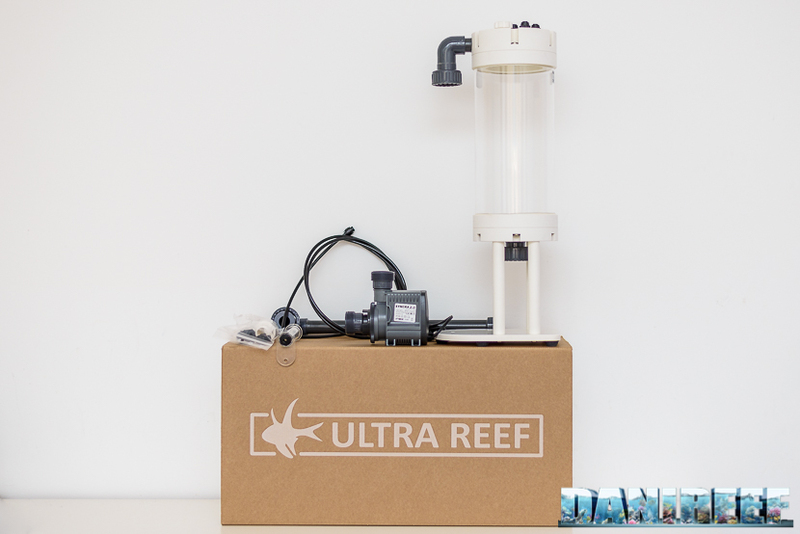 The UltraReef UCS 140 has a pretty big pump, the Sicce 2.0, that, unfortunately, despite our rubber feet, makes the reactor vibrate slightly and so it’s a bit noisier. But this could also be a defect attributable only to my sample. 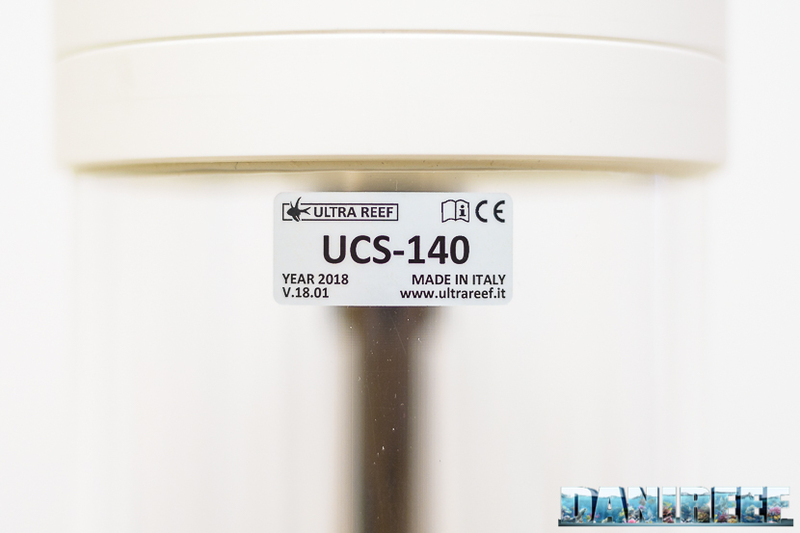 Three years ago we tested the “smaller” UCS-120 , which is pictured below: And here is the UltraReef UCS 140: They have many differences: The diameter is bigger, and therefore so is its capacity. From 3 liters to about 3.5 liters, an improvement of 17%. The pump is changed, increasing the pull a lot (head +18% and flow rate + 69%). 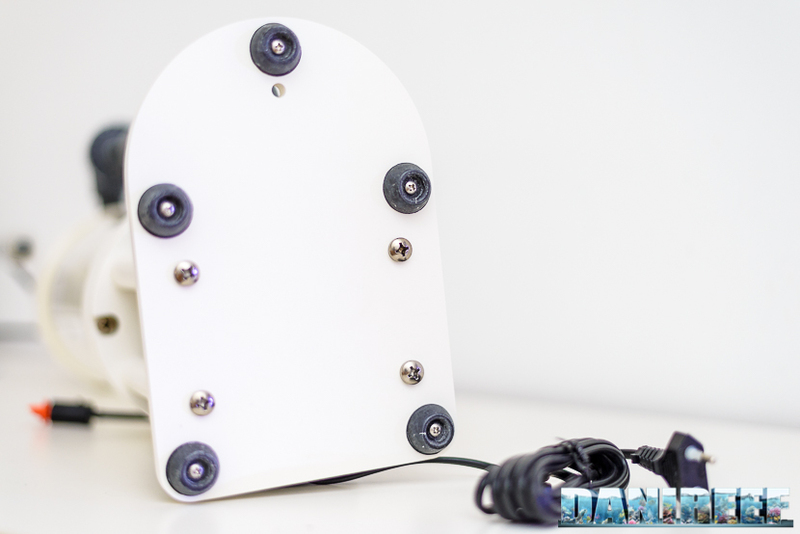 The screw set is completely titanium, and the support plate comes with rubbers to dampen the vibrations. The PVC pipes that sustain the cylinder are now in white PVC and not grey. The superior cap is way more refined, and there’s also the exit for air release. And now the price. It has gone from 380 to 459 euros ($426 to $515 USD), an increase of 20%, which is in line with the improvements of the of the reactor itself. We think that this reactor is an even better value than the old one.